First of all, some general information. Gay marriage has been legal in Spain since 2005. It is one of the few European countries that allows actual marriage, where as others, like France, UK and Germany, only recognize civil unions. The Spanish government also permits homosexual couples to adopt children; applying the same conditions as those for heterosexual couples. In general, there is a high acceptance of homosexuality by Spaniards. However, there is still some discrimination among certain parts of the population. Older people generally think of it as strange, and often have prejudices about it. Also, as you move away from the big cities, there is less and less tolerance. Young people are usually more respectful and see homosexuality as something usual, but as always you can not generalize. There is a Gay neighborhood in Alcala? Sadly, there is no gay neighborhood in Alcala. There is only one “gay” bar, the “6 son 6” (6 Are 6), where you might meet people from Alcala and have a fun night out. It’s located at Calle Divino Valles, 6. It’s not an exclusive bar; it’s outwardly quite unassuming. It’s simply a bar where people are friendly and like to have fun. It might be small, but it’s big enough to meet all kinds of people and see all sorts of things. If you want to go to gay bars and meet people of the LGBT community, we recommend you to go out around Madrid, especially in the neighborhood of Chueca. The district of Chueca is one of the most original and cosmopolitan areas in the central part of Madrid. The streets Hortaleza and Barquillo provide the east and west boundaries, while Fernando VI and Gran Via establish the borders on the north and south of the neighborhood. 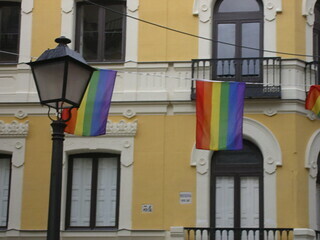 During the nineties Chueca switched its personality to a residence place for the gay community. This radical transformation of its character has sent it to the forefront of Spanish modernity and turned it into a home for new trends. Chueca is a symbol of freedom and tolerance and it is neighborhood where all races and sexual orientations mix. Chueca is named for a plain, small plaza that really isn’t that pretty, but it’s famous for the interesting environment that you can find there at any time of day. There are many different groups of people that mingle in the square. It’s popular for getting something to eat or drink at one of the many terraces, and thanks to the great weather in Madrid, you can enjoy food and drinks outside in the plaza until the early hours of the morning for at least half of the year. There are many pubs, restaurants and “tapa” bars in Chueca to choose from that provide a variety of culinary delights, including traditional dishes to “new” cuisine. Chueca has a very diverse personality due to its location and to the rehabilitation of the neighborhood. It has been transformed from an area rampant with abandoned and dilapidated buildings to an avant guard neighborhood filled with quirky people, modern cafés, restaurants and bars, and designer stores. It possibly has the highest concentration of the most exciting and variegated club scene in the city, making it a must-visit destination for experiencing the nightlife of Madrid. Remember, you don’t need to be a LGBT person to hang out around Chueca. As an average open-minded person you can have lots of fun there. Just try visiting Chueca and tell us how it goes. I am sure it will be awesome! Another way of meeting people is through COGAM (LGBT Collective of Madrid). It is a non-profit association that fights for LGBT rights. They plan different activities, such as the Gay Pride Parade in Madrid, in order to raise awareness and publicize the reality of being LGBT in society. Gay Pride is usually celebrated on the last week or June or the first of July. The COGAM also organizes English conversation exchange groups where you can connect with people while practicing English. If you want more information, visit this site. How to go to Chueca from Alcala? 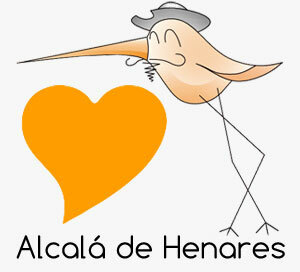 From Alcala de Henares, you can go to Chueca by train (Cercanías RENFE), getting off at the station Recoletos. Another option is to go by bus from Continental Station, but it is more complicated. If you are already in Madrid, take the subway. You should get off at the station “Chueca” on line 5. It is right in the middle of the neighborhood. We hope this information has been useful for you! !